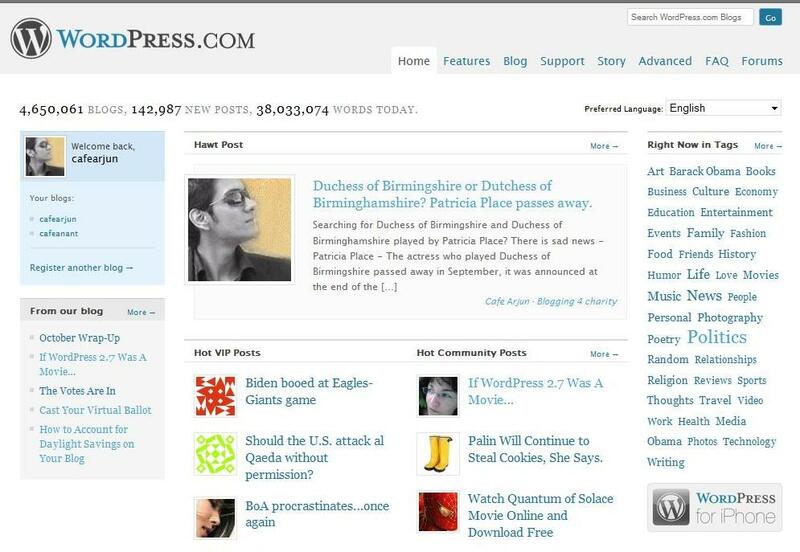 I’m a WordPress top blogger! again! Thanks for the hawt post wordpress! | Cafe Arjun - 15 times WordPress Top Blog! I’m a WordPress top blogger! again! Thanks for the hawt post wordpress! When I first blogged about becoming a WordPress top blogger, I was excited as a child at getting into the top blogs, top posts and growing blogs category on WordPress. After that day, it became a pretty regular thing. There have been 7 more days, including today when CafeArjun.com appeared in the top bloggers page and my posts on top posts and a couple of them as “Hawt posts” (ones that appear as the main post on WordPress.com) on the WordPress.com homepage (max honor for any blogger). There are various other screen shots with different posts on the WordPress.com homepage, but really can’t be bothered to upload all. Top Post number 93 – 5th of November 2008 – Did Katt Williams die in a plane crash? Just want to thank WordPress for giving me a great platform to blog and super solid, robust interface, hosting and services. I have blogged with Blogspot, Blogger, Hubpages, Live pages and many more (as I work in the SEO industry), but have never come across something as brilliant as WordPress. Plus, with the brand new WordPress 2.7, this is just going to improve. I’ll soon write an article about external tools I use when I blog. A post called “How to blog successfully”. Hopefully real soon. ← In what other Austrian city was Mozart born?